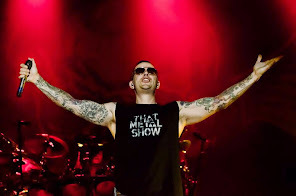 Avenged Sevenfold News: Avenged Sevenfold's M.Shadows: "A lot of people will call you a sell out and..."
Avenged Sevenfold's M.Shadows: "A lot of people will call you a sell out and..."
Why write the GDD yourself? It’s a very sensitive subject: being a band and doing something like this. A lot of people will call you a sell out and want to knock it down as soon as it’s out, and we’ve seen that with a lot of the reviews. They don’t understand where we’re coming from, they have no clue that we’ve made the game ourselves, but a lot of them label us as people that will licence our name out and have nothing else to do with the final game. We’ve been very clear in the press that we made this game ourselves. Our mascot, our logo and what we do is very important to us, so we want to make sure it comes directly from us, not some developers that know nothing about us.